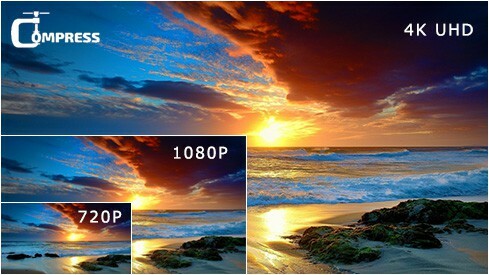 4K resolution, also known as 4K, is one of the trendy tags sweeping over the world in recent years. At present, you can get into 4K videos in many cases, like watching 4K UHD videos on 4K TVs or monitors, recording 4K with professional camcorders, shooting 4K @60fps or 30fps on iPhone, streaming high definition 4K video from YouTube, Netflix and more. It of course brings you an ultimate visual experience compared with HD videos, whereas the other side of coin may stop you from possessing 4K UHD videos and compress 4K videos instead. 4K videos are too large in size and steal over your device space quickly? The fast 4k video compressor with Nvidia Cuda/Nvenc and Intel QSV accelerated- shrink 4K videos to 1080p/720p, change video codec/format, lower bitrate, frame rate and crop unwanted parts to reduce 4K file size without quality loss. Why You Compress 4K UHD Videos? The first comes to video file size. A minute of 4K at 60fps is approximately 400MB, while only 90MB is taken for a minute of 1080p at 60fps. Thus if you're a 4K video fan, it's easy to run out of the storage space especially for lower 64GB iPhone or limited free iCloud storage. Yet another is the compatibility issue. Though you're able to watch 4K UHD videos on 4K media players, TVs, or monitors, there are more devices that are not compatible with 4K resolution like iPhone iPad Android devices, Macbook Pro/Air, and Windows PCs. Not to mention sometimes you cannot import 4K to iMovie for editing or fail to upload 4K video YouTube or the like. Thus, you do need process and compress 4K ultras HD videos. However, when you're trying to shrink 4K videos, you'll find the common 4K video processing tools performs fairly slow, and worse still, the shrinked 4K UHD video looks much blurry and even pixilated. So to get out of the trouble, a more impressive 4K video compressor is essential to reduce 4K video size without losing quality at fast speed. While some one would say compression is not possible without quality loss. Yes, but not exactly. Before 4K video compression, it's best to know the terms of lossy and lossless compression. Lossless Compression. When a file that has been compressed can be decoded back into its original form with zero loss of information, the compression can be Lossless. Actually, it's almost a pipe dream unless vector images are scaled based on pure mathematical principles, or an algorithm that stores duplicate pixel data in some place can replace them just as easily. Lossy Compression. If, after compression, the original file cannot be brought back again, then that would be Lossy. Generally, all the video compression we've mentioned is lossy since the codec is lossy as such. Visually Lossless Compression. Lossy compression that produces negligible differences may be called visually lossless. And the aim of every algorithm is to achieve a visually lossless look. Usually what we're talking about shrinking video without losing quality means visually lossless compression indeed. 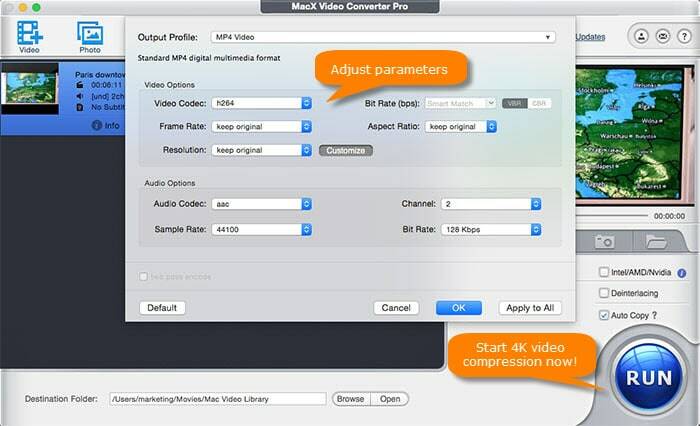 Speaking of a tool to reduce 4K video file size, MacX Video Converter Pro is undoubtedly the best 4K video compressor, which doesn't process 4K videos as slow as Handbrake, and has no 4K video cannot be imported or exported issue occurred on iMovie and Final Cut Pro. And you know, video downsizing depends upon an array of factors including format, codec, trimming, cropping, changing bite rate, frame rate and other parameters. It allows to reduce 4K videos through adjusting all listed parameters. Convert 4K video to any formats and codecs, like converting 4K UHD video to MP4, AVI, FLV and 200 more formats, transcoding 4K H264 to HEVC, VP9. Adjust video parameters like compressing 4K to 1080p/720p or lower SD resolution, decreasing the bitrate at 20-50%, lowering frame rate from 4K 60fps to 30fps, or changing 4:3 aspect ratio to 16:9 etc. Resize 4K ultra HD by trimming and cropping. The basic editing feature allows you to trim the video length, crop any unwanted parts like black bars. Better yet, with the built-in High-Quality engine and deinterlacing features, MacX Video Converter Pro drops no quality loss of your video on visual, let alone the unwanted noise or blurry content. Also worth noting is that, no matter which way you adopted, MacX will run in a speed 5 times faster than Handbrake or other competitors to shrink 4K videos, thanks to the Intel QSV/NVIDIA/AMD hardware acceleration. How to Cut Down 4K UHD Video to Smaller Size without Quality Loss? 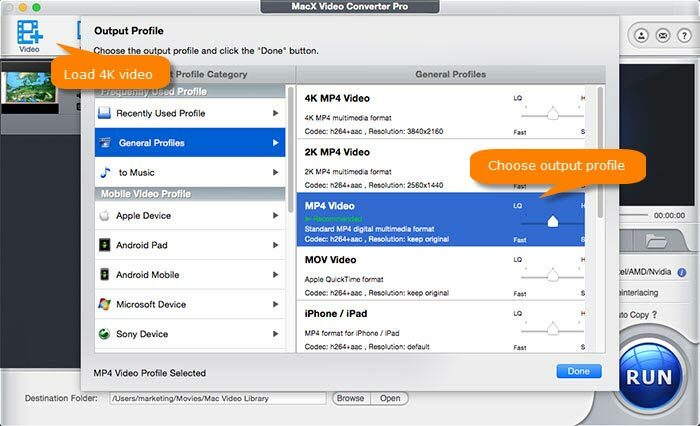 The process of zooming out 4K video with MacX Video Converter Pro can be easy and quick. Firstly, go for the 4K video compressor free download for Mac or Windows version for PCs as needed. Given that several ways are available to reduce 4K video size with this tool, you can track one or more. It all depends on how much do you want to compress your 4K video. Step 1: Load your 4K video. Launch the program on your computer and click on + Video to load the 4K ultra video you want to process. You're able to import more than one for batch 4K video compression as well. Step 2: Choose output profiles and optionally adjust parameters. After video loaded, a window with dozens of output profiles pops up. For widest compatibility, you're suggested to choose General Profiles > MP4 Video (h264+aac) > Done. While to shrink 4K video to the hilt, select General Profiles > HEVC Video > Done, which will reduce 4K file size up to 50% without losing quality. Choose the appropriate resolution according to the usage of your video, for example, 4K to 1080p/720p for watching on desktops or uploading to YouTube, 4K to 640p/480p/360p for playback kinds of portable gadgets. Bitrate can be reduced by 20-50% of the original one. In this case, your videos will shrink considerably in size without noticeable changes by naked eyes. Change the 4:3 aspect ratio to 16:9 will reduce the video size to some extent, even though not so much obviously. Click on Edit button on main interface, then Trim > Enable Trimming to trim the length of video or Crop & Expand > Enable Crop to adjust the position and size of the video image. Step 3: Start 4K video compression now! Tap RUN icon on the lower right corner of the main interface, and your 4K video reduction is in processing. It'll take you a few minutes, but not necessarily. If your computer enables hardware acceleration, the program will tick the box of Hardware Encoder automatically, and it will save your time up to 5 times. 4K Video Not Playing on VLC? Check Solutions Here!